In January, I was bitten by the "blue bug". Not an actual bug, just an obsession with the colour blue. 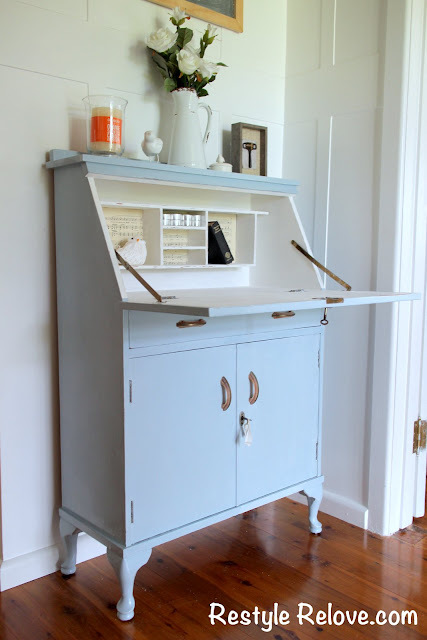 Hence, a lot of stuff got painted blue, including my entryway drop front secretary. And, I've added some neutral decor to the top. Including my beloved enamel jug and faux roses. The little plant I picked up on sale at Spotlight. I'm beginning to fall in love with small potted artificial greenery. I've had the cute little birdie for years. It's one of my absolute favourite things. The framed key I created a while ago, and the twine goes perfectly with some vintage scissors. The chalkboard says it all. I'm definitely loving having a more neutral farmhouse style palette back. Swooning over this beautiful re love. You know me and neutral so I love this. Beautiful job Julie. It looks very pretty in white!